Real Madrid moved back into the top four of La Liga by thumping lowly Deportivo La Coruna 7 – 1 on Sunday, with Cristiano Ronaldo ending a miserable run of league form with a late double. 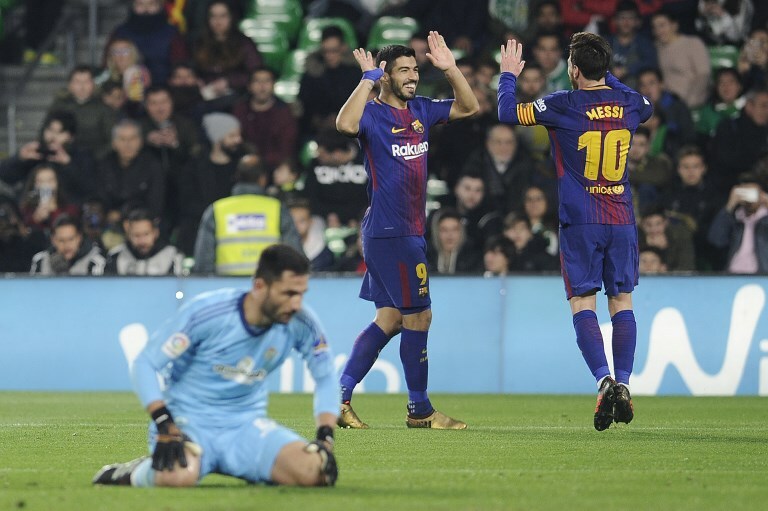 But Barcelona still extended their lead to 11 points – and 19 ahead of Real Madrid – as Lionel Messi and Luis Suarez both hit a brace in a 5 – 0 romp at Real Betis. Ronaldo had only scored four league goals before Sunday ’s clash with third – from-bottom Deportivo , but the Portuguese added Real ’s fifth and sixth with a smart volley and a diving header as they moved back above Villarreal and into the Champions League places . Villarreal had temporarily taken fourth with a 2 – 1 win over Levante on Saturday after beating Real at the Bernabeu for the first time ever last week . Gareth Bale and Nacho also bagged braces each side of half- time and Luka Modric curled home a 68 th- minute beauty as Real came back from a shock early deficit , a 23 rd-minute tap – in from Adrian , to romp to an emphatic victory and ease the pressure on coach Zinedine Zidane. “ We needed that. In any case, it ’s what we were missing in the sense that scoring seven goals at home this season, it ’s hugely satisfying , and a relief ,” said Zidane . The win leaves Real five points behind Valencia in third, after Marcelino ’s side had two players sent off in a shock 2 – 1 loss at lowly Las Palmas on Saturday . Real had come into Sunday ’s match in crisis following some dismal performances that culminated in last week’s defeat to Villarreal, and the mess seemed to have grown deeper when Adrian tapped home Lucas Perez’s low cross. However , the home side reacted immediately and by half- time were 2 – 1 up thanks to Nacho ’s neat first – time strike and a superb curling effort from Bale . The floodgates opened in the second half, with Bale adding his second from a towering header and Luka Modric expertly whipping home Real’s fourth. Ronaldo met Casemiro’s cross to make it five and then crashed home Lucas Vazquez ’s cross , taking a boot in the face from Fabian Schar in the process . As Ronaldo was led off the pitch to have his bleeding head quickly patched up he asked to see the phone of one of Real ’s medical staff and , pointing the camera at himself , used it to check the damage to his face. Nacho completed the rout in the dying minutes . Second – placed Atletico Madrid ’s 1 – 1 draw with Girona on Saturday meant Barca extended their lead with victory , leaving coach Ernesto Valverde waxing lyrical about Messi. “ You have to enjoy what Messi does — I’ve suffered against him as an opposing player and I know what it is,” he said . After a goalless first period, Ivan Rakitic opened the scoring on 59 minutes, converting a sublime pass from Suarez . Messi thumped home the second from outside the box on 64 minutes before he and Rakitic teamed up to present Suarez with a volley on 69 minutes to effectively seal the three points. Betis were making mistakes at the back and when Zouhair Feddal clumsily gave the ball away on halfway to Suarez , the Uruguayan sent Messi scampering away. Faced with two defenders , Messi dummied to shoot, drifted past both and calmly slotted home past goalkeeper Antonio Adan . There was still time for Suarez to complete his brace with a crisp finish after Messi had driven at the heart of an over- matched defence . The only downside for the league leaders was a hamstring injury to Thomas Vermaelen in the first half that precipitated French centre – back Samuel Umtiti ’s own return from a hamstring problem. Earlier , Joseba Zaldua scored a last – minute equaliser as Leganes came back from two goals down to draw 2 – 2 at Alaves.